If flash storage has a defining characteristic, it would be speed. While flash storage was initially known for its astounding speed, more recently flash storage is gaining a reputation for delivering consistent performance. Without any moving parts, flash storage is capable of massive improvements in IOPS over traditional HDD storage. While enterprise-level HDD is capable of around 180 IOPS, comparable flash storage is capable of performance of over a thousand times faster than HDD. The result of such huge gains in performance is massive improvements in system and application performance. Until recently, the capital layout for flash storage was the single limiting factor to broad enterprise adoption. It doesn’t help that many storage vendors are hesitant to publish their prices. Generally speaking, over the past decade, the price per GB of flash storage has fallen at a much faster rate than the price of HDD, leaving some pundits to predict price parity in the near future. Bottom line is that flash storage will always be more expensive than HDD simply because it is a better product. But for your enterprise, the cost of flash storage should not longer be a limiting factor. The fact is that current prices for flash storage are no longer a factor of ten, like they were five years ago. Today, you can get flash storage for about three times the cost of HDD. When you consider the performance gains we just referenced, that price is a steal. The capacity of flash storage solutions used to be another limiting factor. But like price, that constraint has long been removed, with many manufacturers producing flash SSD solutions that are two to three times the capacity of HDD solutions. For an enterprise data center, this means smaller physical space is needed while power consumption is reduced due to the increased storage density offered by enterprise flash storage solutions. When we talk about reliability in storage solutions, the discussion needs to include two important and different measurements: Uncorrectable Bit Error Rate (UBER) and Mean Time Between Failures (MTBF). The difference is important because the risk mitigation strategy is different for each. While it is true that flash storage has a higher UBER than HDD solutions, this is easily mitigated with diligent backup and recovery processes. MTBF, however, results in hardware replacement costs. Simply because flash storage has no moving parts, it has a much higher MBTF than HDDs, which results in lower maintenance, repair and replacement costs when flash is deployed. And studies have confirmed that using flash storage over HDD results in much lower maintenance, repair and replacement costs. Big data, IoT, Mobility, Consumer Sentiment, Fraud Prevention, Virtual Desktop, multiple, unstructured data formats: all highly demanding workloads with massive amounts of data that need to be managed in real-time if your enterprise is going to thrive. We have already noted the enormous gains in IOPS offered by flash storage solutions. Combined with reduced latency, this makes flash storage ideal for handling the increased workloads that exist in the enterprise today. For many enterprises, this may be the defining justification for switching from HDD to flash as an enterprise storage solution. Together, these five reasons for switching from HDD to flash storage for your enterprise storage solution (and each reason is a compelling justification on its own), translate into an overall lower Total Cost of Ownership. When you can improve the ability of your infrastructure to handle increasingly demanding workloads in real-time, improve storage reliability, increase the available storage capacity while decreasing your data center footprint and energy consumption, and do it all for a lower capital price, what would be the reason not to? 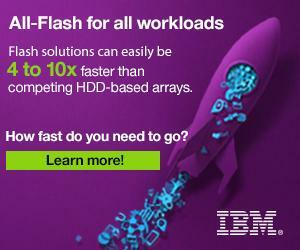 Get the power of Flash Storage today!